Teach good things offers a variety of advertising zones, which can be rented for a week, a month or longer. Buying advertising platforms online «What Is Good», you become the center of attention of the international community of people who understand information flows and know how to distinguish good from evil. Project audience – adult, conscious people with active life position. If you believe your brand or product will interest our readers, we will be glad to place your ad on our site. Your ad (text and images) must comply with the “Rules” use of the respective social network. The advertisement has to bring to people’s lives is something good and useful. We work with 100% advance payment from the advertiser. Recording Type: text link, image, video, audio. The audience of the project are grown up, responsible, active people. The project “Teach good” carries out strict moderation of advertising offers. Care for the content of your advertisement, it should bring something really good, positive and useful to the life of our readers. Your brand or product should be interested to our audience. 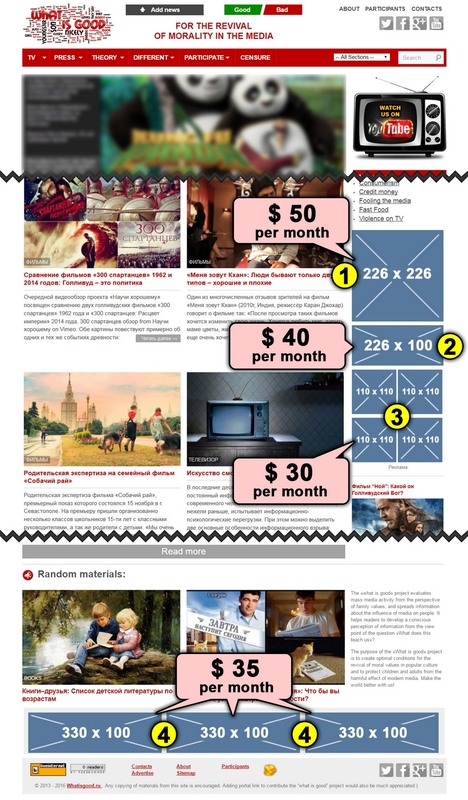 «What Is Good» offers different advertising zones which can be rent for a week, a month or for a longer period of time. By getting advertising platforms on the site«What Is Good» you hit the highlight in the international community of people who want to make our world a little bit better. Clickable static picture (JPEG, JPG) with the link to your resource. The banner is seen from the main page and all the other pages of the site except articles. The banner is seen from the main page and all the other pages and articles of the site. The banner is seen in one article which you choose. The cost of banner making is included into the cost of advertising space. Banner creating is realized by a qualified designer, the style is based on your own preferences. If you already have the banner of the required size, you can use it. There is an option of renting advertising spaces for ONE WEEK, ONE MONTH or for a longer period of time. Discounts are allowed for those who rent advertising space for a year or more. A feedback form on the website. If it’s difficult to choose , we will consult you and will help to find the most convenient and effective way of giving the advertisement and the appropriate advertising space. If you have any other ideas of financing, do not hesitate to contact us.